Founded in 1923, Laminazione Sottile is the leading Italian Company in the field of rolled aluminium products. With more than 105.000 tons produced in 2017, they cover a wide range of product applications such as packaging, HVAC-R, automotive, cookware and building. Laminazione Sottile has the ability to supply aluminium coils, sheet, foil and circles in different alloys and widths with gauges ranging from 6 mm down to 6 microns. On February 2015 the Final Acceptance Certificate of their new MINO Cold Mill was signed by Laminazione Sottile, marking the successful completion of Phase 1 of its long term investment programme in rolling assets. 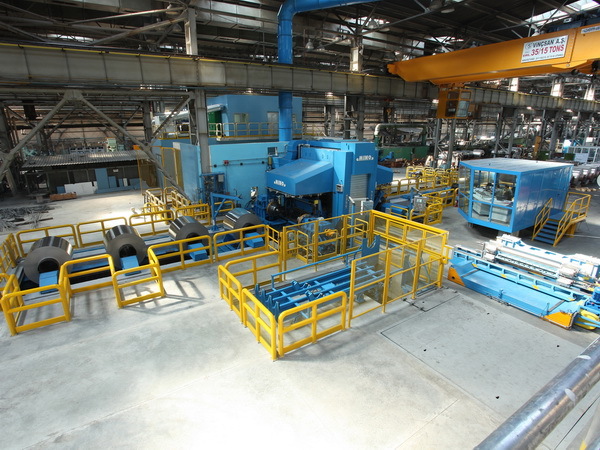 In 2017 and following the successful completion of Phase 1, MINO received the green light to proceed with the implementation of Phase 2 of the programme, consisting of the design, manufacture and supply of a new Foil Finishing Mill. - the latest Cold Mill commissioned in 2015. MINO is particularly proud of the long term partnership with Laminazione Sottile, the extent of which now covers nearly 40 years. This relationship is evident by the contract awards given to MINO in hot, cold and foil rolling mills which show a deep level of cooperation and technical trust between the two Companies. The new Foil Finishing Mill has high-speed rolling potential and will display the latest MINO mill stand design concepts. On-line strip doubling and a number of electro/mechanical solutions allow for tension control at reels over an extremely broad range of material specifications. Complimenting the mill stand are automatic spool transfer devices, a side trimmer and state-of-the-art sensors & instruments. As with all new MINO mills, the ‘Avanti’ advanced AGC/AFC system controls flatness and thickness of rolled strip. AC motors & drives provide low maintenance, flexible control of speed and torque. A key objective within the electrical and automation systems is to achieve high percentage in the Overall Equipment Effectiveness (OEE) levels and to optimise the equipment reliability and operational safety. The Mill is currently under pre-assembly in MINO’s workshop in Alessandria.